Meh..... Already have Sleeping Dogs and Outlast on PS4 and I've always hated Burnout Paradise. So not the best month for me. January's games have been announced. First half of the month has Deathtrap: World of Van Helsing (which is some sort of combination of tower defense and action RPG.. sounds interesting....) and The Cave, a backward compatible action game. We may have to slot in some Killer Instinct event later on this month or in early February. It did good during the Anniversary Week and with people getting all these new fighters for free, it should be fun. We'll see what we can do. Hopefully I'm home for this, Got seasons 1 and 2 now...so many characters to choose from <3. I'll have to test out Project Cars' multiplayer experience. We could do a another Games with Gold style event in the future. March Games With Gold have been announced! The months start off with Layers of Fear for XB1 and the amazing Borderlands 2 for Xbox 360/BC. Second half of the month brings Evolve for XB1 and Heavy Weapon for Xbox 360/BC. I liked Evolve. I'll be more than willing to squad up with members who get the game and want someone to play with! Evolve has been so much fun. This Monday night (3.20.17) we'll be having an open Club party for any and all members who want to play. We'll take turns being the Monster! Thanks to all who came out to play Evolve last night. Organizing and promotion was kept local/low key but turnout was good nonetheless. I streamed the whole thing. Probably will break it up into parts and share it at some point. The new Games with Gold for June 2017 have been announced! Xbox Live Gold members can download SpeedRunners for free during the month of June. Watch_Dogs will be available as a free download from June 16th to July 15th. Additionally, to celebrate the new release of Phantom Dust, Gold members get a free multiplayer content DLC pack for Phantom Dust starting June 1st, which includes a variety of valuable skills and abilities to help you defeat your enemies in the re-release of this original Xbox classic. For Xbox 360 Backwards compatible games, starting Thursday, June 1st, Assassin’s Creed III will be free for Xbox Live Gold members through June 15th. Then on June 16th, Xbox Live Gold Members can download Dragon Age: Origins for free through June 30th. The second round of Games with Gold roll out tomorrow as a heads up. It's that time of the month again guys.... Free game announcement time! On Xbox One, you can download Grow Up for free starting July1, and Runbow starting July 16. On Xbox 360 (and Xbox One w/ Backward Compatibility) , starting July 1st, Kane & Lynch 2 will be free through July 15th. Then on July 16th, you can download LEGO Pirates of the Caribbean: The Video Game for free through July 31st. Runbow seems like it could have potential as a fun group game, with up to 9 players (local and online) able to race against each other, with the catch being obstacles and platforms appear and disappear as the background color changes. And there are several modes, including Arena, King of the Hill, ColourMaster, and The Bowhemoth. Interesting lineup.....I can see RunBow as a game we could do as an event. Kane & Lynch 2 is not the best game out there, but it will be free and it is co-op. Misery can be shared while playing. Well....Garza and I did a run through of Kane & Lynch 2 the other day. It took us a little bit over two hours to beat. He hated the game, but eh..I enjoyed it. Yeah I tried to play it w/ my husband since you can do split screen.... It was having a lot of problems running, and it ended up freezing after we finished just the first chapter. August's GWG have been announced! 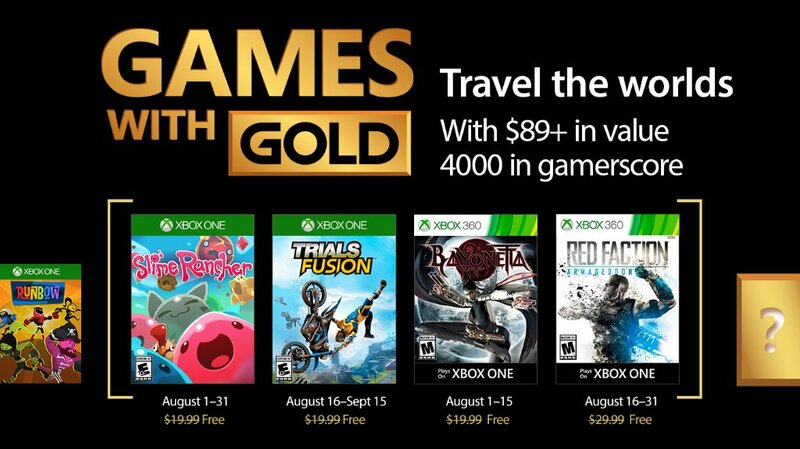 Another pretty decent month coming up with Slime Rancher (Aug 1-31) and Trials Fusion (Aug 15 -Sep 15) for XB1, as well as Bayonetta (Aug 1-15) and Red Faction:Armageddon (Aug 16-31) for XB360 and Backwards Compatible on XB1. Slime Rancher has a sort of calming-Minecraft like vibe, as you collect and take care of slimes to make money, while Trials Fusion is a BMX platformer/racing game that has added multiplayer for up to 8 online. Bayonetta is by now a classic, made by the folks behind Resident Evil and Devil May Cry, offering some shooting action from the 360. Red Faction is also full of action, taking you to Mars to find out whats going on underground with a long-dormant race of Martian creatures. Fusion and Red Faction I see are now available for download.